Eastview UMC believes that all of us should be in right relationship with God. Part of relating to God involves getting our hearts and minds in line with the heart and mind of Jesus Christ. Among our church’s ministries of piety are knowing God through study, talking opportunities for spiritual formation and praying for others. We often hear references to “the gospel” of Jesus Christ. What is the Gospel? The word “gospel” is a Greek word that simply means “good news.” Thus the gospel of Jesus Christ is the good news of Jesus Christ. And part of that good news is that Jesus Christ, through his birth, life, death and resurrection, has made it possible for each and every person to really know God – just as we would know our parent or best friend. God can be know! Eastview UMC expects all of its members to actively engage in the process of gaining a greate knowledge of Jesus Christ. There are many ways this can be done, but a primary means of knowing God is by studying the bible – God’s very own Word. Opportunities about at Eastview UMC to study scripture in a friendly, engaging, informative setting. Our church has designed Bible studies that target all age groups. Check our events page for dates and times of study groups and gathering or contact us directly for additional information. Chrysalis weekends are intended for teenagers and college-age young adults. The local Chrysalis community is located in nearby Gahanna, Ohio and our pastor serves as the community spiritual director. Click here for a link to the local community. Emmaus weekends are intended for adults, and are intended to renew the church from within and raise up leaders among the laity. There are Emmaus communities in nearby Marysville, Grove City and Reynoldsburg. Kairos weekends are held for incarcerated men inside prison walls. Click here to be directed to Karios’ Ohio chapter. In Spring of 2013, many of our members felt a call from God to devote an intentional space in our church solely for the purpose of prayer. 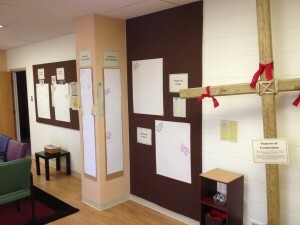 After much prayer, giving and hard work, the Eastview UMC Prayer Room came into being. Anyone can walk in and find a peaceful, quiet place filled with many ways to pray to God, including art, reading, reflection, writing and much more. 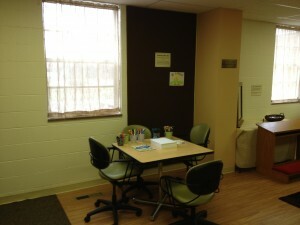 Some members use the Prayer Room during our worship services to provide spiritual support for our congregation. We love nothing more than to minister to our neighbors through prayer. 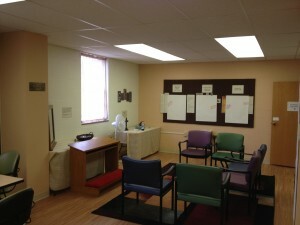 If you have a prayer request, feel free to come by the Prayer Room and talk to God about it or contact us directly. It would be a privilege to pray with you.